PeopleSoft has evolved over the years and new features are constantly being added to it. Some of the features are delivered as part of PeopleTools and many others with selective adoption that is utilized using PeopleSoft Update Manager (PUM). There are several features/frameworks that have been introduced to help with adding and managing customizations in PeopleSoft. 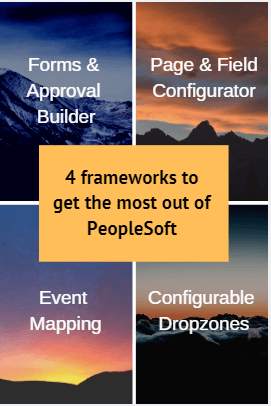 Here are 4 frameworks that can help you get the most out of PeopleSoft. The Forms and Approval Builder lets you design online forms and associate those with approval processes for routing within your organization with no coding needed. Custom pages, requests and processes that are currently outside of PeopleSoft can be very easily added to PeopleSoft using Forms and Approval Builder. Manual processes in your organization can be converted to paperless process that is based on workflow approvals. This also helps in maintaining an audit trail. No coding is required. Use drag and drop builder to create forms. Future upgrades to your PeopleSoft system will not require you to update these forms, since the forms you create are not customizations. Once a form is published, users navigate to the form using the main menu, complete the fields and submit it for approval. Each published form includes three tabs: Form, Instructions, and Attachments. We did a webinar some time ago and covered Forms and Approval Builder. Here is the video that discusses PeopleSoft Forms and Approval Builder. Page and Field Configuration eliminates the need to update page customizations through application designer. You can make changes to page configuration via PIA navigation making it easier even for a functional user to make the required configuration. Here are some of the things that you can do using PeopleSoft Page and Field Configurator. You can configure the page based on different user roles so page appears different to one set of users whereas different configuration is shown to other users. All of this can be configured based on your requirement. 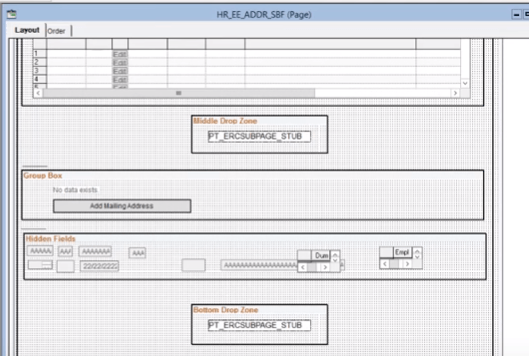 Watch this video by Oracle showing how PeopleSoft Page and Field Configurator works. Event Mapping allows you to add your custom code to page without modifying the actual object itself. This can be done by mapping an application class event handler into a delivered Peoplecode Event. It enables users to insert or associate custom code to the component, page or component record field level events without modifying the actual objects. Main benefit of event mapping is to reduce customization to delivered code and hence minimizing the retrofitting during a future upgrade. Map a component event to a Related Content Service Definition. Introduced with PeopleTools 8.57 , configurable dropzones allows you to add fields that are displayed on delivered fluid pages without customizing the fluid page. At design time, a placeholder subpage stub (PT_ERCSUBPAGE_STUB) is inserted into a related content group box on the fluid page definition. Then you go ahead and create subpages definition and associate those with one or more dropzones. These dropzones are then replaced with actual subpage at the time of component build process.